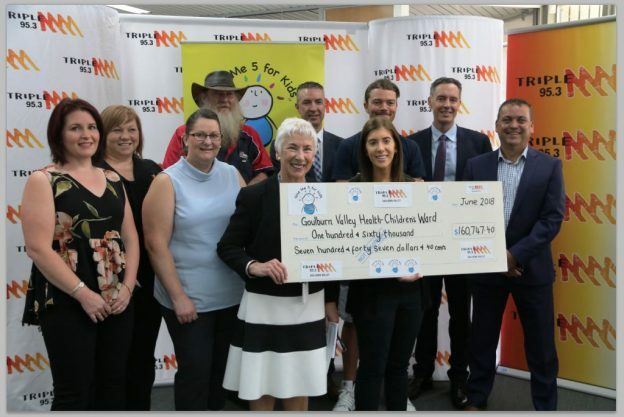 A big thank you to the Goulburn Valley community who raised more than $160,000 ($160,747.40 to be exact) for this year’s Give Me 5 For Kids fundraising campaign. The funds raised go to our Paediatrics Unit and this year the money has enabled GV Health to purchase equipment including new paediatric beds and cots, as well as a state-of-the art isolette for our premature babies. As always, a huge thank you to Paul Archer – The Battery Man – who single handedly raised $120,000 of those funds through his annual battery drive. Paul has worked tirelessly over the past six years, generating hundreds of thousands of dollars for the GM5FK initiative. GM5K runs each year in June, but donations are accepted year-round. Head to www.giveme5forkids.com.au to donate and keep an eye on 95.3 Triple M Facebook and Instagram pages for 2019 event details. This entry was posted in Uncategorized on November 29, 2018 by Jodie Fleming.